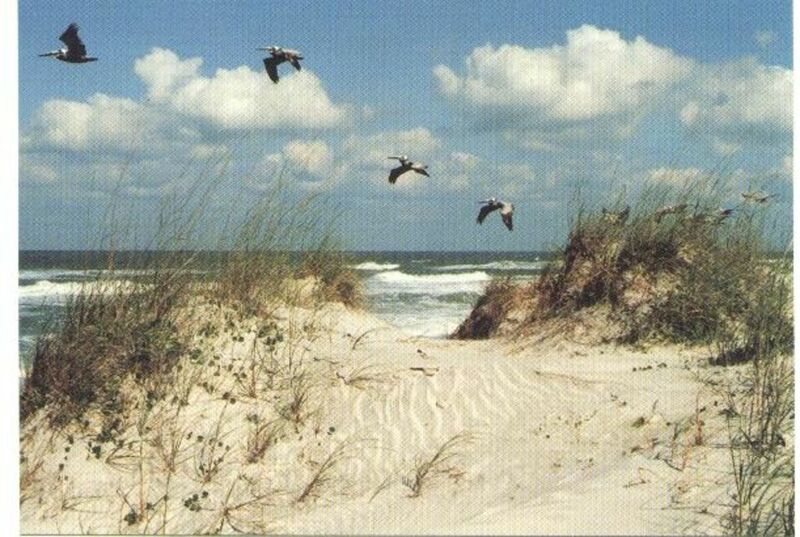 Until the mid-18th century, the St. Augustine Beach area was used as pasture land for cattle and quarries for coquina. In 1730, a businessman from New York by the name of Jessie Fish claimed the coastal land south of the lighthouse and established the local citrus industry. The Fish family cultivated this land from 1730 to 1820's. In the 1880's, St. Augustine Beach was called South Beach. The transportation from St. Augustine was provided via the South Beach Railroad. This train brought tourists to see the alligator farm, quarries, and lighthouse and to relax along the beaches. In 1920, the first hotels in St. Augustine Beach brought tourists who enjoyed this pastoral escape from formal St. Augustine. There were no paved roads. The only way to travel was over the dunes or to drive on the beach. The history of St. Augustine Beach is closely tied to the history of early exploration in North America. The settlements of the French, British and Spanish explorers in this area played an important role in the rich history of Florida and the United States. BUT COME SEE FOR YOURSELF--Explore the historic sights of St. Augustine as well as the relaxing offerings of Anastasia Island. IT'S A GREAT PLACE TO VACATION! St. Augustine Beach and Tennis Club Condominium...Family friendly! Wide sandy beach only three minutes walk from your patio. This is one of St. Augustine Beach's truly oceanfront condominiums. Master bedroom has queen-size bed and second bedroom has twins. Dining area seats six. Fully-equipped kitchen. HD TV. The condo is CLEAN and completely and comfortably furnished (including bed and bath linens) for a relaxing getaway--just bring your own beach towels, beach chairs, boogie and surf boards, beach toys etc. If and when you tire of the beach, it's just a short drive over the Bridge of Lions to the old world charm of St. Augustine with its historic sites and fine restaurants. There are also many unique restaurants located on the island and nearby. Enjoy nearby attractions like the St. Augustine Lighthouse and Museum where you can climb the 219 steps to the top of the Lighthouse for a breathtaking view of the area. You may also consider visiting the St. Augustine Alligator Farm, Marineland, Anastasia State Park, St. Johns County Fishing Pier, the Castillo de San Marcos (a 17th Century fortress that has never been taken by force). Take a carriage ride through the Oldest City or ride a tour train. SUMMER SPECIAL--Free outdoor concerts featuring local talent teamed with local restaurants offering their signature cuisine at concerts (less than $10) on Wednesday evenings at the St. Augustine Beach Pier Pavilion. FARMERS MARKETS --Wednesday at the pier and Saturday at the Amphitheatre. PLAY GOLF? Tee off at any of a number of fine golf courses. Venture to Disney World (two hours away) or the World Golf Village (25 minutes) for a round of golf, a tour of the World Golf Hall of Fame, or an I-Max movie on a newly enlarged 3-D screen. For the less enthusiastic golfer, there are several put-put courses nearby. The Nation's Oldest City of St. Augustine is just a short drive across the Bridge of Lions where a whole new world of the old world awaits visitors. Just 2 minutes to the beach dunes walkover! 2 minutes from patio to the beach over a sloped boardwalk to the beach (no steps). St. Augustine Beach is ranked one of the top ten beaches in Florida offering wide sandy beaches. This is a no-smoking, no-pets allowed unit. Sleeps 4 comfortably. Limited to 6 overnight guests. In addition to the dining room, you may also choose to eat outdoors on the patio. Bicycle rack is available in the parking lot. Patio looks out to the courtyard garden and pool areas. The beach is just three minutes away from the patio via the dunes walkover. Atlantic Beach & Tennis Club is adjacent to our parking lot. Check for rates. CLUB HAS TWO GYMS (INCLUDING A LADIES ONLY GYM ) 12 har-tru tennis courts, outdoor & indoor saltwater heated pools. OPTIONAL memberships are available at Atlantic Beach and Tennis Club located adjacent to our parking lot--10 har-tru tennis courts, indoor and outdoor pools, sauna, whirlpool, steamroom, co-ed and all-ladies gyms. Nice two bedroom unit and very convenient to the pools and ocean beach. Lorraine was great to work with and addressed any concerns and questions immediately. A future destination for us definitely. Marineland Dolphin Adventure and other water related activities 5 miles away. EARLY (8:30 p.m.) NEW YEARS EVE FIREWORKS VISIBLE FROM OUR BOARDWALK! $100 refundable security deposit is required. Cleaning is extra--$75 for weekly, $100 for monthly rentals. Use of Atlantic Beach and Tennis Club facilities is NOT included with the rental. Weekly and monthly rates/memberships are available at the facility.